Get answers to your health questions fast, from experts with years of experience. 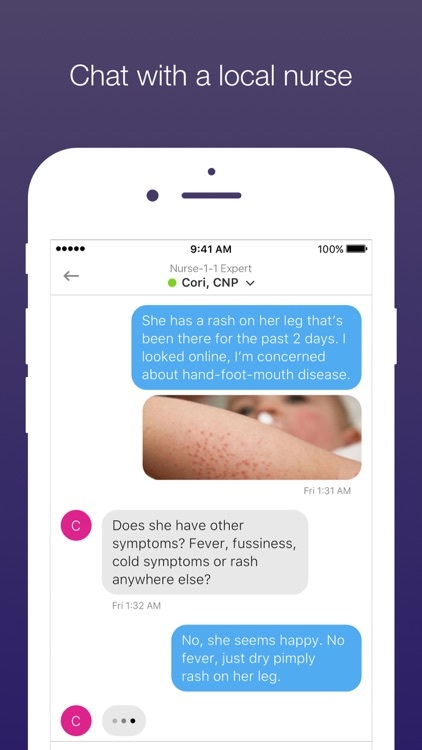 Chat with a local nurse in real time-- send text messages and photos, and get answers from a local nurse 24/7. Have you ever read an online article about your symptoms or your child’s symptoms, and then couldn’t stop worrying? Or had a health concern after hours, and wondered how serious it was? Do you have a quick question or concern, but don’t want to wait for your next doctor’s appointment? Or just decided to visit the ER based on something you read online that scared only to later find out the expensive visit to the ER wasn’t necessary. Nurse-1-1 can help. No medical records, prescriptions, or noisy, germy waiting rooms. Just fast answers from trusted professionals. We match you with the experts who are right for your needs. Save time, money, and your sanity—get those burning questions answered now! 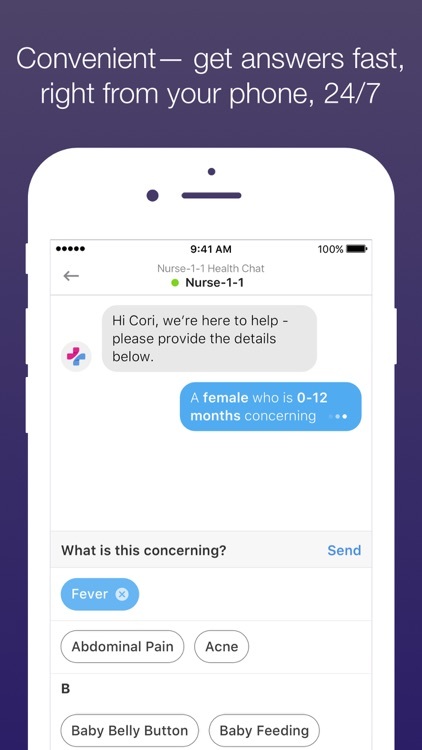 • You can instantly chat with a nurse. 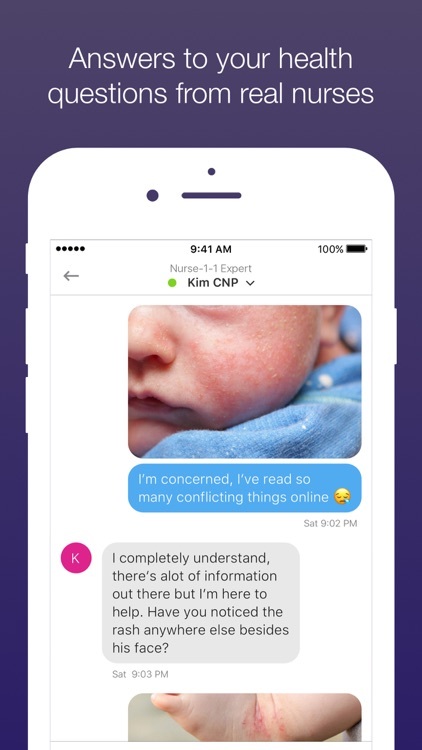 • Start a chat by tapping the big “new concern” button. • Answer a few quick questions to help us find the right expert for your need. 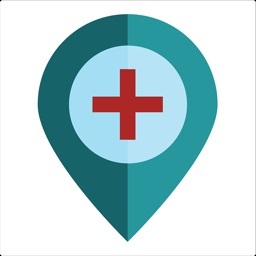 • We’ll instantly connect you with the best nurse to help resolve your concern. 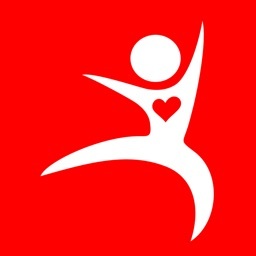 • All our nurses are US-based, certified Nurse Practitioners, Registered nurses, or Physician assistants, and undergo a background check and a review process by Nurse-1-1’s medical team. 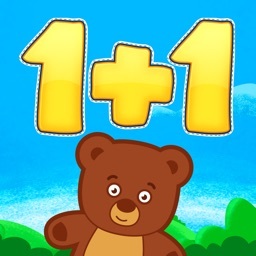 • If you use any type of text messaging app, then you’ll know how to use Nurse-1-1 to chat. • Nurse-1-1 is secure and HIPAA compliant. So go ahead, ask those embarrassing or seemingly dumb questions we all have from time to time! Our caring, well-trained nurses are there to support you. 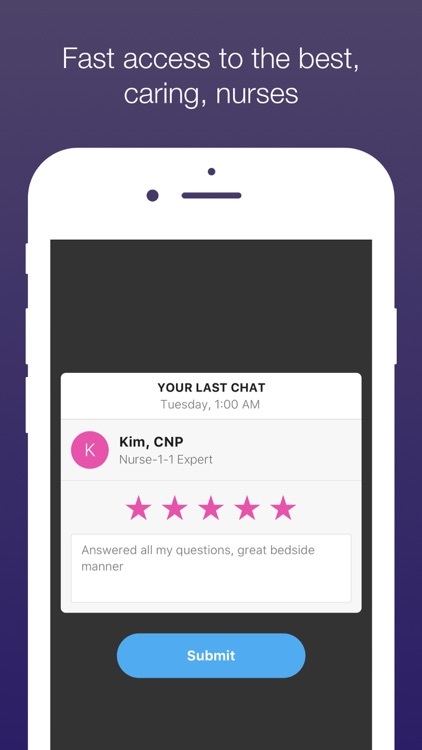 • At the end of the chat, parents and nurses rate each other on a five-star scale and give feedback on how the conversation went. This rating system helps us improve quality and create a positive experience. Nurse-1-1 uses these scores to help better match our nurses with your specific health concerns. • You never need insurance to chat with nurses on Nurse-1-1. 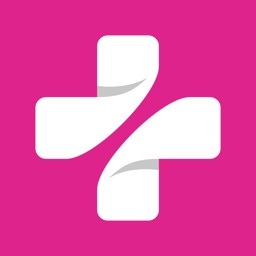 • Nurse-1-1 is free when you sign up to chat with your own provider or if we connect you with a local nurse at a partnering clinic or office. • Nurses are available 24/7. We are there for you when you need them, whenever that may be. • Nurses on Nurse-1-1 who aren’t your providers will never prescribe medications, order tests, or practice medicine on nurse-1-1. Don’t worry, Nurse-1-1 is for informational purposes only. • Just get answers and have a friendly chat with someone who knows what they’re talking about. • You’ll never have to worry or scare yourself reading medical information online again. • If you have a medical emergency, call 911 or the proper emergency services in your area. 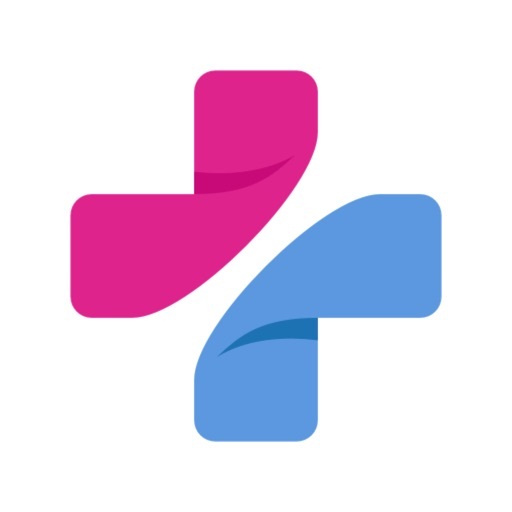 • Nurse-1-1 is intended for non-urgent medical questions and should never be used as a replacement to your medical provider or primary care office. • Here are just a few of the common issues nurses on Nurse-1-1 can help with. 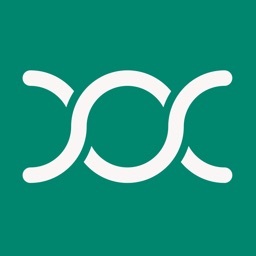 Questions or concerns relating to: rashes, eczema, pimples, acne, bites, molluscum, diaper rash, cough, abdominal pain, sore throat, cough, fever, injuries, cuts, lacerations, teething, potty training, solid food, development, male teen issues, urinary or gynecological issues, female teen issues, birth control, dysmenorrhea, painful or heavy periods, influenza (flu), flu exposure or flu like symptoms, urinary tract infections, UTI, sexual health, STDs, HIV questions, cold sores, pink eye, eye infections, conjunctivitis, vomiting, diarrhea and more. • We also have nurses who focus on newborn baby questions about: fever, common newborn rashes, eczema, concerns with belly button, feeding issues, lactation, breastfeeding, formula, sleeping concerns, stooling concerns, constipation, normal development and more.